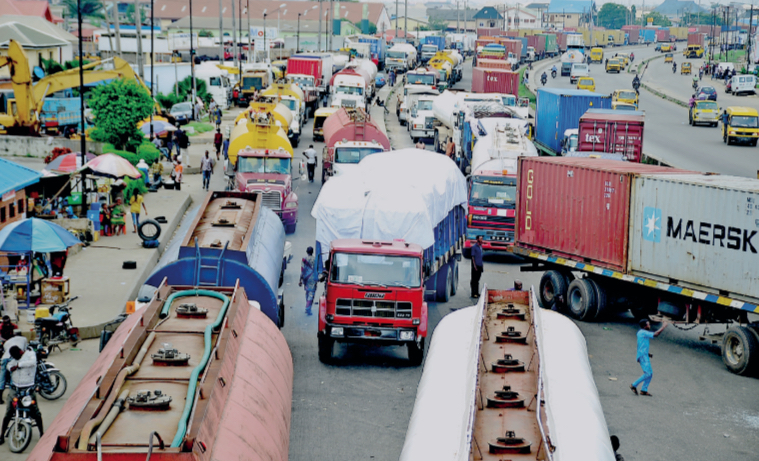 So how come a hundred trailers making the lives and business of people living in Apapa has now grown to 12,000 powerful tormentors of the whole city? Kaka: You mean terrorists are here, Boko Haram, Hakika or all of them? Koko: The terrorists that are in town are worse than those ones, trust me. Kaka: Al-Qaeda? Did Osama bin-Ladin resurrect? Guy, the suspense is killing me. Who are these terrorists? Lagos is the commercial nerve centre of this country, you know? Koko: Exactly, and there is nerve gas in town. Kaka: Yeeparipa!!!!! Nerve gas? Please let’s just go pack and find our way out of here. Let’s just go to your village or mine, far from this madding crowd. Nerve gas! Koko: And what if I tell you we can’t leave? Koko: At least, you can’t drive out of Lagos right now. Kaka: That’s not siege or terrorism, that’s armageddon. What is going on? What do you mean we can’t drive? Okay let’s start trekking………. Koko: Look, we are stuck. Lagos is in trouble. There is a lockdown. Kaka: Shall we tell the president? Koko: He is aware. Kaka: What about Governor Ambode? Koko: He is also aware. Kaka: The armed forces nko? Koko: They are all in the know. Kaka: Am I dreaming? Is it even possible that there can be a set of terrorists somewhere in Nigeria, least of all Lagos that will look the power that be in the eye and call their bluff? Are you sure you don’t have malaria? Koko: So, you’d like to take me to the hospital? Kaka: Yes, please. I’m sure you are not yourself. You don’t even know if it’s killer herdsmen sect or Al-Qaeda that has us all boxed in, caged in our homes. Koko: I know them, and you’d know too if you had been following what’s going on around you. Kaka: Speak or forever be silent. Koko: Petrol tankers, trucks, all 12,000 of them have taken over Lagos roads, hemming in hundreds of side streets and millions of Lagosians. Kaka: (heaves a sigh) Ordinary trucks and truckers? Those rickety things are the reason you want to give me a heart attack? Koko: Imagine 12,000 rickety things on a straight line and I assure you that heart attack is a sure thing. Kaka: Now I know you are ill. Since when did trailers muzzling Lagos and suffocating Lagosians become a matter of urgent national importance? Koko: Since the Vice President had to visit and order 72-hour patrol. Kaka: (laughs long and hard). Please, what is new about VP or a minister or a governor visiting Apapa and issuing ultimatums? Tell me what it achieved in the past? It has been done many times. In fact, I remember under BRF as Lagos governor, the state bought intimidating towing machines, and on one Saturday alone, towed dozens of those offensive rickety things to the seat of government in Alausa. Koko: Really, so what happened after that? Kaka: The owners and the drivers of the rickety things retreated, regrouped and returned in full force and proportion. Koko: Are you saying even if they retreat now they’d be back? Kaka: I’m saying we have never counted 12,000 of them before. Koko: They will double our trouble? What have we done to them? Kaka: Or triple it if they can. Koko: In a country that has 109 senators and 360 honourable members? Kaka: Leave that matter. These trailers are bigger than the present 469 lawmakers and the ones before them. They are bigger than the lawmakers in Lagos too, past and present. Koko: Don’t be ridiculous. These are serious organs of government, men and women we elected. Kaka: Seriously? You have to remind Lagosians that they elected people to protect them from trucks and trailers? Do you know they are reading this? Kaka: Maybe they would do something. Koko: Or maybe we should just accept our fate and cede Lagos to truck drivers altogether. Kaka: So how come a hundred trailers making the lives and business of people living in Apapa has now grown to 12,000 powerful tormentors of the whole city? Koko: How did we get here? Kaka: By road. I heard you people are launching a national carrier. Koko: Only the logo is ready for now. Kaka: Cool. You can fly and watch the torment of Lagos from the sky. Koko: Don’t change the subject. The Lagos problem can be fixed and we will fix it. Kaka: No, you can’t fix this problem. It is bigger than all of us. The trailers are bigger than all of us. Koko: That’s not possible. We have laws. The governor has powers. The VP has spoken. Kaka: All of you can speak and spark from now till hell cools off, those truckers always have the final say. They are not flies that you can shove off with the wave of your hand. Koko: So they have overpowered and conquered us? Koko: Even if we build them a new park? Kaka: First, you won’t build them a new park because you are too busy with more important things. Koko: Such as Nigerian Air and 2019? Kaka: Nonsense, we can multitask, we will build them a park. Koko: These trailers hate parks, they are allergic to confinement, they love fresh air – the kind you can get only on nice bridges like the ones at Western Avenue and Mile 2. Koko: They are 117 of them lounging on Eko Bridge and 1050 descending Ijora bridge. Kaka: Eledumare! What’s the fate of those bridges? Koko: Why are you asking me? Ask the 1,850 trucks on the Marina bridge. Kaka: Do you think there is a conspiracy to destroy all the bridges in Lagos all at once? Kaka: Not all of them, just the ones from Iyana Isolo to Tin Can ports. Maybe the destruction of others will commence later. Koko: They should quickly shutdown Third Mainland bridge before the trailers would find a way to get there. Kaka: We will shut it for a while for assessment. You can imagine what Lagos would look and feel like if Third Mainland bridge is not in use and there are 12,000 trailers of different lengths snaking up the entire Ikorodu road. Koko: And if it rains. Kaka: It will be like war. Koko: Or we can all stay at home and pretend there is curfew or oro festival going on. Kaka: So we should just curl up and wait for the bridges to collapse on our heads? Koko: Or we can tell our government officials to prove that they can protect us. Kaka: Can’t they protect us? FRSC just announced that more than 1000 Nigerians have died in truck-related accidents. Koko: Maybe we should tell the people that we vote into office to take fresh oaths before Amadioha and Ayelala that they would stop trailers from incinerating voters, falling off bridges and killing children and pregnant women, like Boko Haram.